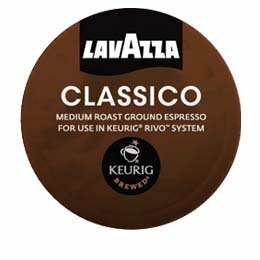 Crafted by Lavazza, the Espresso Classico is a full bodied medium roast with notes of tropical fruit and sweet floral qualities with a lingering fruity finish. Each of the 8 boxes come packed with 18 Rivo packs that can be used with the Keurig Rivo Cappuccino and Latte System. The Keurig Rivo single-cup brewing system uses a special packaging for espresso and espresso based beverages called Rivo portion packs or Rivo packs. Each Rivo pack is an airtight, mini-brewer that locks out oxygen, light, moisture and humidity while locking in freshness and flavor. Simply insert the no mess Rivo pack into the brewer and hit the brew button for a fresh-brewed, perfect cup of espresso in under a minute. The Keurig Rivo brewing system allows you to brew cappuccinos, lattes, and other espresso based beverages in one machine with an attached milk frother. Please note that the Keurig Rivo portion packs are only compatible with the Keurig Rivo brewing system.